Our homes are becoming more and more filled and dependent on technology. I love being able to turn my lights on and off from my iPhone. I like being able to see multiple vantage points of my security systems from my handheld devices when away from home. Can’t wait until my entire home is in the cloud and all I have to do is sit and think about what I want it to do and then it does that. But until then…. I wait. 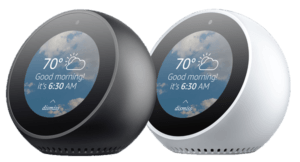 Amazon has a new product out now called the Echo Spot. It’s another Echo smart speaker that you can use your voice to command and control it and talk to Amazon’s Alexa voice assistant. Now, what set the $130 Echo Spot apart is its circular touch screen. 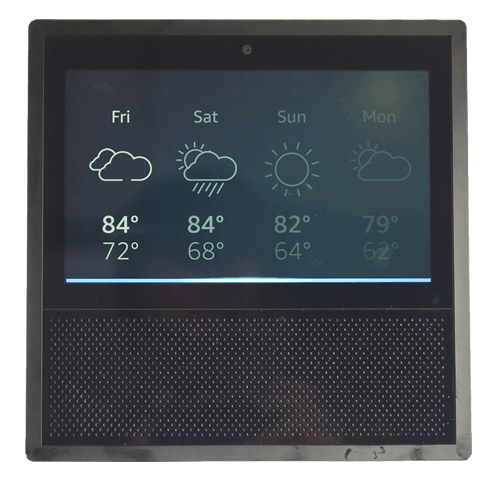 Which can display a clock, information, lists, video and more? It is akin to the Echo Show from earlier in 2017. 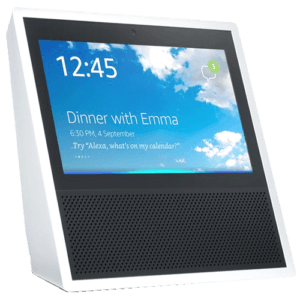 You can also use that screen and the Spot’s camera to make video calls with other Echo devices and phones. Basically, the Spot is a smaller, cuter, less expensive version of the Show with many of the same capabilities. 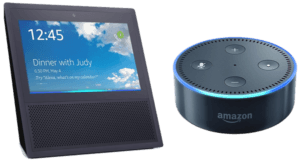 It is to the Show, what the Echo Dot is to the full-size Echo. That means it does Echo stuff. It plays music, it answers questions, it controls smartphone gadgets. 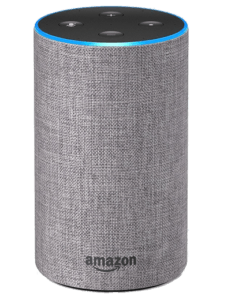 It can set timers and alarms, and all of the other stuff that other Echo devices can do. You can get it in white or black. I prefer the white model. The Spot’s display measures 2.5″ across and it’s 480 pixels wide. That makes it a bit too small to comfortably watch videos on. You can do it if you want, but since Amazon and Google are in a fight right now, YouTube doesn’t work. So, that makes the options for videos pretty limited. Mostly you’ll get movie trailers and Amazon Prime video content. The screen is great for displaying a clock and there are 16 different faces to choose from. It has analogue and digital designs, and four of them are customizable with your own photos. In addition, it displays album art, to-do lists, shopping lists and weather information right at a glance. On top of the Spot are buttons for controlling the volume and muting the mic and camera. There are also four far-field microphones which were just about as capable to hear my voice just about as well as the seven microphone arrays on other Echo devices. 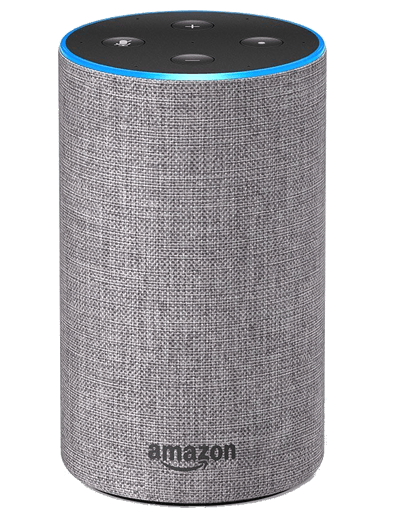 The Spot has a 1.4″ speaker that sounds way better than the Echo Dot’s tinny speaker when Alexa talks. It also sounds fine for casual music listening. But it’s obviously not going to work as well for that as a larger Echo or a Sonis One. If you do want better sound, you can link the Spot to a larger speaker with a cable or Bluetooth, which is a nice convenience to have. 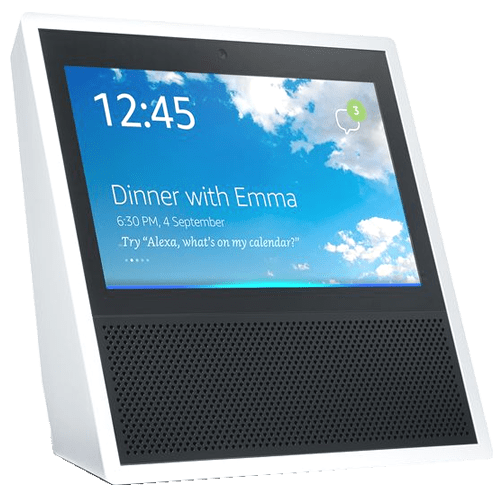 Just like the Echo Show, you can use the Spot to make video calls to other Echo devices with a screen, or to a phone using Amazon’s Alexa app. In practice this works pretty well, the image is clear, the sound is good and you can easily see the person that you are calling and your own image right in the Spot’s display. 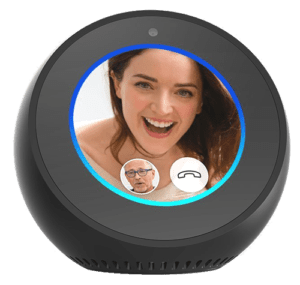 You can also enable that creepy drop in feature that lets you connect to another Echo Spot or Show directly without anyone answering the call. Video calling is a feature that’s better suited for the larger Show than the smaller Spot. The Spot is a perfect device to replace an alarm clock on your nightstand, but I cannot ever imagine wanting to make video calls while I’m in my bedroom. The top button will disable both the camera and microphones for voice control. But you can disable the camera independently within the Spots settings menu. Admittedly that’s not the most reassuring thing, so you might be tempted to put a piece of tape over the Spot’s camera like you might do on your laptop‘s webcam. 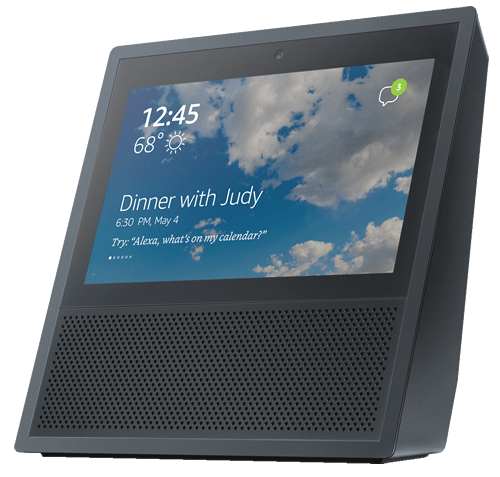 However, Amazon says that the Spot uses the camera for the display’s auto-brightness, so you may end up with a screen that’s way too bright or way too dim if you cover it up. Maybe one day Amazon will sell a version of this without a camera. That may settle up some privacy concerns. If you don’t have any concerns about privacy, the Spot is actually a great alarm clock for your bedroom. You can set alarms with your voice. 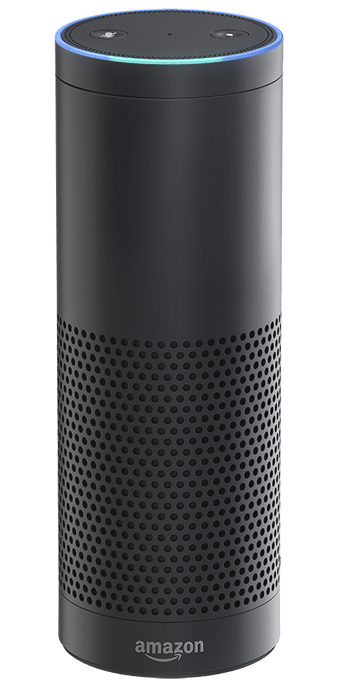 Additionally you can ask Alexa to wake you up to a specific artist, song or playlist. You can also snooze the alarm with your voice, or you can dismiss it by touching the screen. The Spot will even display the current weather conditions when your alarm goes off, that way you know how to dress for the day when you wake up. 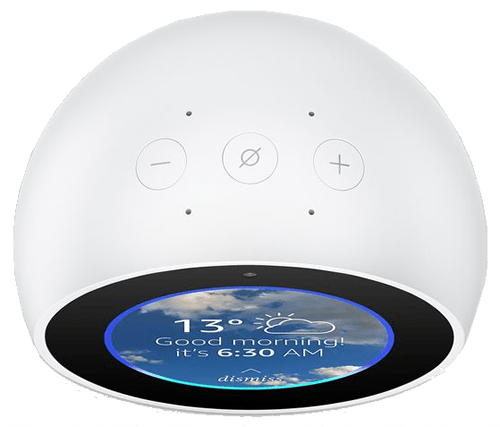 It’s basically the perfect smart alarm clock if it didn’t have the anxiety-inducing camera built into the front of it. Amazon claims that the Spot can work in other parts of your home as well. However, it’s probably not the best of the Echo lineup for other uses. The larger Show is better if you want a voice-controlled display in your kitchen for recipes and background video watching while cooking or doing dishes. 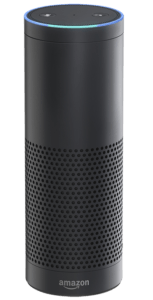 The audio-only Echo devices are better for a living room or an office. There you probably already have other screens for media consumption. All of this makes the Spot kind of a tough sell. It’s not exactly cheap, and it has a camera that you might not want in your bedroom, but despite that, I like it. It looks cool. It doesn’t take up a lot of space on the nightstand, and it can replace an alarm clock and the Echo Dot if you already have one.